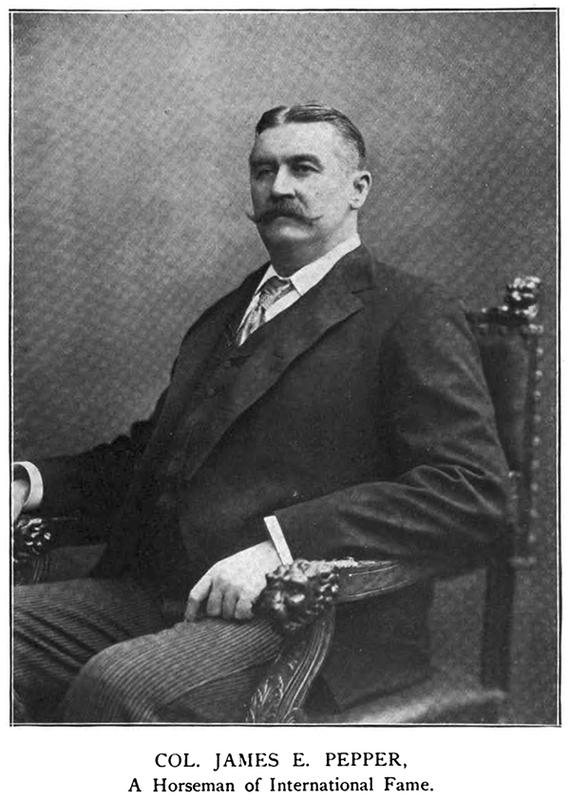 Colonel James E. Pepper (1850-1906), Master Distiller, was a larger-than-life Bourbon Industrialist and flamboyant promoter of his family brand. He was the third generation to produce 'Old Pepper' whiskey, "The Oldest and Best Brand of Whisky made in Kentucky," founded in 1780 during the American Revolution. His namesake distillery in Lexington, Kentucky was at one point the largest whiskey distillery in the United States. An avid and noted horseman, Col. Pepper operated the finest stable in Kentucky. His thoroughbreds competed in the Kentucky Derby and in races across America and throughout Europe. He traveled in an ornate private rail car named "The Old Pepper," painted with images of his famed whiskey label, and he spent a considerable amount of time in Manhattan, where he would travel to promote his brand. During his visits to New York, often at the Waldorf Astoria Hotel, Colonel Pepper was known to socialize with other American captains of industry, including John D. Rockefeller, Theodore Roosevelt, C.V. Vanderbilt, Charles A. Pillsbury, Fred Pabst, Charles L. Tiffany, & William Steinway. It was at the Waldorf that Colonel Pepper is credited with introducing the world to the “Old Fashioned” cocktail, which was said to have been invented in his honor by a bartender at the famed Pendennis Club in Louisville. The Colonel was a staunch advocate for the whiskey business. He was a vocal opponent of the infamous "Whisky Trust" of the 1890's, lobbied the state of Kentucky to change its laws so that he could bottle his own whiskey at his distillery, and was instrumental in the implementation of the Bottled in Bond Act of 1897. Colonel Pepper proudly proclaimed his continued use of his grandfather’s original Revolutionary‐era recipes, and as such nicknamed his whiskey 'Old 1776'. entire history of the brand.